A spoonful of sugar helps the medicine go down, but this pair of sterling silver stud earrings are sweeter! 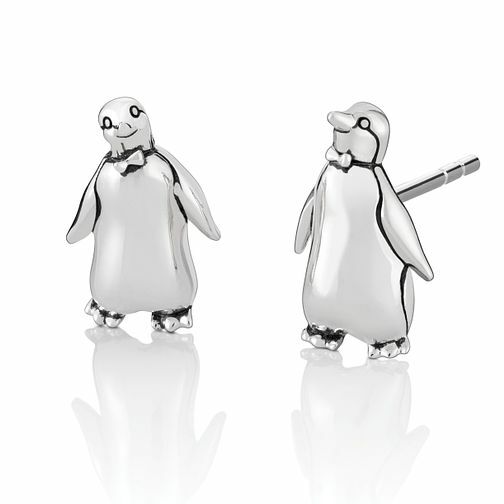 A charming pair of penguins are creatively crafted complete with bow-ties. A fun way to bring some Disney magic to your jewellery box from Chamilia. Discover your unique style with Chamilia jewellery. Chamilia Disney Mary Poppins Tuxedo Penguin Earrings is rated 5.0 out of 5 by 2. Rated 5 out of 5 by Anonymous from She loved it This was a small gift for the misses. She loved how cute they were and wore them straight away so she must have liked them! They are a little on the small side but I think if they were any bigger they would look a bit too big! High quality with no complaints about the product. Ordered on line and was delivered quickly. Rated 5 out of 5 by Anonymous from Practically perfect in every way These were given to me as a Christmas gift from my SO and I couldn’t be more enthralled with them. I usually don’t wear stud earrings due to issues with my ears, but these sit comfortably, with a bit of a gap at the back (if required), and the backs click into place and hold securely. I was surprised at the size of the backs, as usually they are tiny, but these are a good size for the rather chunky penguins. I’ve been complimented on them several times now, and have yet to find an issue with them. I’d definitely recommend these! For our full returns policy click here. For assistance with your purchase, visit our help centre for advice & tips so you can buy confidently with H.Samuel. ©Signet Trading Limited 2019. All rights reserved. H.Samuel and Helps you say it better are trade marks of Signet or its licensors.